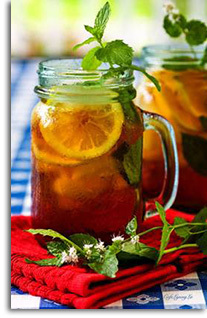 Celebrating National Iced Tea Month in June! As a gesture of their new friendship, Dukale invited Hugh to plant some coffee seedlings on his farm -- Hugh accepted and named two trees after his own children, Oscar and Ava. Hugh was so inspired by his experience with Dukale, that he made a promise to advocate on behalf of farmers in developing countries and pledged to only drink fair trade coffee. At the end of his trip, Hugh visited the Ethiopia Commodity Exchange in Addis Ababa to see how coffee is traded on the global market. While watching the coffee prices fluctuate, Hugh found himself rooting for the prices to go up in order to benefit hard working coffee farmers. Upon his return home to New York City, Hugh was invited to speak at United Nations Climate Week where he made an impassioned plea to world leaders to provide support for farmers like Dukale in developing countries. However, after his UN speech, Hugh still felt that there was more he could do and began talking to people in his neighborhood and at local coffee shops about the impact of fair trade coffee on the environment and the lives of the growers. He came to understand that something as simple as a cup of coffee had the potential to reduce global poverty through the choices consumers made in the United States. After sharing his newfound insights and experiences in Ethiopia with a friend in the restaurant business, Hugh decided the best way for him to have a direct impact on poverty reduction was to start a coffee company in order to trade directly with the growers. In 2011, Hugh launched Laughing Man Coffee & Tea to provide a marketplace for farmers like Dukale to sell their goods to consumers across the U.S.
Years later, the coffee trees Hugh and Dukale planted started to bear fruit. Dukale increased production on his farm, hired more local workers, and re-invested his profits to purchase additional land. Adanesh now runs a successful cafe in their village and their eldest child, Elias, is on track to become the first family member to graduate high school. Hugh’s coffee company, Laughing Man, recently partnered with one of the world's largest purchasers of fair trade coffee to distribute their products all over the world. As part of his ongoing commitment, Hugh contributes 100% of his profits to the Laughing Man Foundation, which he created to support educational programs, community development and social entrepreneurs around the world. Click here to purchase or find out more. The Sonoma Teas collection represents a new concept in an herbal tea blend. The appreciation of Sonoma County’s renowned vineyards has been previously relegated only to wine enthusiasts. With the introduction of this new tea collection, everyone can now enjoy a refreshing beverage that showcases the best qualities and flavors from fine wine grape skins. Free of caffeine, alcohol, and calories, Sonoma Teas are a wonderful alternative to high calorie soft drinks and sugary juices. The fine wine grape skins used in the Sonoma Teas collection also contain antioxidants, which contribute to a diverse and healthy diet. Similar to wine, the offerings in the Sonoma Tea collection impart unique and identifying characteristics. Sonoma Chardonnay – Reminiscent of a vacation in a glass, Sonoma Chardonnay Iced Tea has a base of Sonoma Chardonnay fine wine grape skins infused with tropical pineapple and sweet peach notes. Sonoma Rosé – Sonoma Rosé Iced Tea is a sophisticated sipper made from Sonoma Pinot Noir and Sauvignon Blanc fine wine grape skins married with ripe strawberries and crisp red apples resulting in a light and floral finish. Sonoma Cabernet – Sonoma Cabernet Iced Tea brings a festive infusion of Sonoma Cabernet Sauvignon fine wine grape skins with sweet, juicy oranges and the deep berry note of black currants. Skip the wine goblet and pour into a big, tall glass to enjoy this refreshing berry blend. In the Coffee and Tea Newsletter “test kitchen” we tried the Sonoma Rosé. Overall, light and refreshing. Would make a delicious thirst-quenching drink on a hot summer day—maybe serve/enjoy with a fruit garnish—pulling out the fruit flavors used in each variety to enhance the grape skins. Sonoma Teas utilizes fine wine grape skins sourced from WholeVine, a new line of wholesome offerings with all-natural ingredients from fine wine vineyards in and around Sonoma County. Founded by Barbara Banke of Kendall Jackson Family Estates and partner Peggy Furth, WholeVine shares The Republic of Tea’s commitment to sustainability and is dedicated to helping the fine wine industry reduce its environmental footprint by generating new uses for vineyard byproducts. The Sonoma Teas collection is packaged in steel tins that keep the teas fresh for two years. Each tin contains six pouches of tea that produce six quarts or 24 servings. Priced at just $7.99, Sonoma Teas are an affordable luxury for entertaining friends and family. In line with The Republic of Tea’s commitment to sustainability and natural materials, each tea pouch is made with unbleached fibers and do not include any unnecessary paper tags, strings or staples. Sonoma Iced Teas are now available for purchase on www.RepublicofTea.com. If coffee is the foundation of your food pyramid, then this is your book. Inspired by Ryoko Iwata's popular website, I Love Coffee (en.ilovecoffee.jp), Coffee Gives Me Superpowers is overflowing with infographics and fun, interesting facts about the most awesome beverage on earth. The book includes the most popular pieces on the site, such as "Your Brain on Beer vs. Coffee," "10 Coffee Myths," "The Best Time of Day to Drink Coffee (According to Science)," and "10 Things You Probably Didn't Know about Caffeine," plus 25 percent new, original material that is available only in this book. Ryoko Iwata is a Japanese coffee-lover living in Seattle. When she's caffeinated, she creates and writes infographics, facts, quizzes, and other fun visual stuff about coffee, and sometimes sushi, on her Web site, I Love Coffee. $9.99. Format: Hardcover – Nonjacketed. Dimensions: 8.3 x 8.2. ISBN: 9781449460839. Publication Date: 4/7/2015. Pages: 96. Available at Amazon.com and other booksellers. ENTER TO WIN: Visit the Coffee and Tea Festival Facebook page to enter. Click here. No purchase necessary. Contest ends June 5, 2015. Winner will be randomly selected and will be announced on Facebook. Thanks to the Coffee and Tea Festival & Andrews McMeel Publishing for sponsoring this fun contest. According to the Tea Association of the USA, approximately 85% of tea consumed in America is iced and over the last ten years, Ready-To-Drink Tea (RTD) has grown more than 15 fold. In 2012, Ready-To-Drink sales were conservatively estimated at $4.8 billion and this trend continues in 2013.